A natural biological product used to supplement the cow’s colostrum or drug therapy. Non-medicated, it contains a special formulation of lactic acid-producing bacteria, dried milk protein, lactase enzymes and dried egg solids to aid in fighting disease, minimize intestinal infections and enhance appetite and digestion. 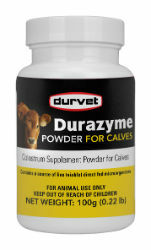 Durazyme Powder for Calves increases energy levels. Calves become more active and vigorous resulting in increased nursing action and higher colostrum intake. Can be administered during therapy with drugs. Dissolves rapidly. Ideal for starting calves. For use in chilled & weak calves. Helps establish gut microflora. Administer at first sign of diarrhea. No slaughter withdrawal. Give one level scoop (5 gm) to calves to supplement colostrum immediately after birth. Dried egg product, Montmorillonite clay, Dried whey product, Ascorbic acid, Dried Bacillus subtilis fermentation product, Dried Enterococcus faecium fermentation product, Dried Lactobacillus acidophilus fermentation product, Dried Bifidobacterium thermophilum fermentation product, Dried Bifidobacterium longum fermentation product, Dried Aspergillus niger fermentation extract, Fructooligosaccharides, Vanilla flavor.